From 77 to 144 € the night I book ! 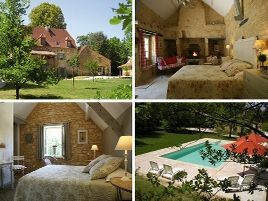 In the Perigord Noir, near the charming medieval town of Sarlat, in the Dordogne valley, an old farmhouse with outbuildings, renovated in the pure tradition of the region. Large, wooded grounds with swimming pool. The self-contained rooms are comfortable, their decor in keeping with the style of the buildings, with exposed wooden beams and stone walls. The Tilleul room is the old breadoven house and Chêne is a 2-roomed duplex. Delicious breakfasts and guest meals. Warm, attentive welcome..
- Pêche en étangs. - Golfs de Vitrac et de Souillac à 10 km. 5 rooms with shower and WC. 77 euros (1 pers. ), 84 euros (2 pers. ), 106 euros (3 pers. ), 144 euros (4 pers.). Extra bed 24 euros. Baby equipment, games, children's meals. For teenagers: swimming pool. Family room. Large, shady grounds. The closest station is Sarlat, located at 7 km. The closest airport is Bergerac, to 65 km.